AKQA’s guided mobile tour provides customers at the Starbucks Roastery with a way to follow the story behind their exclusive coffee, from harvesting to tasting the coffee beans. 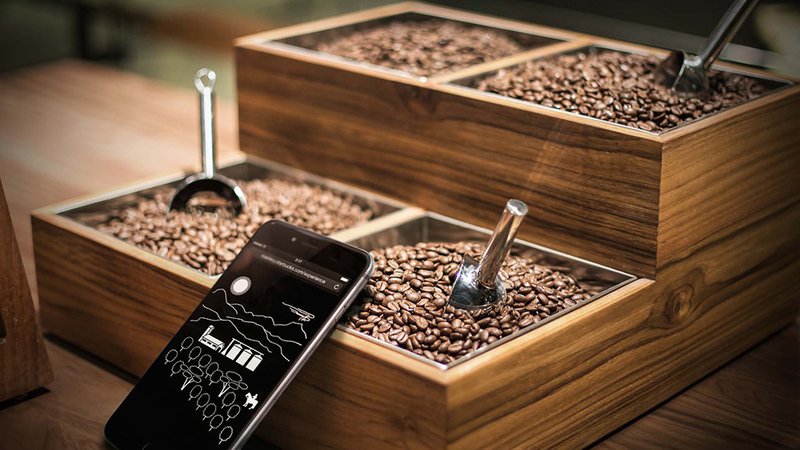 The web app allows Starbucks Reserve to immerse visitors within the store design while expressing the quality, craft and exclusivity of the coffee beans and subsequently the brand itself. As the team’s lead user experience strategist, I was responsible for understanding the brand and deriving user experience concepts from this case study for future reference. I played a major role in applying UX principles and concepts to interpret the brand and the experience through brand strategy and research, utilizing a brand attribute matrix and journey framework. AKQA’s website provides a glimpse of the agency’s design thinking. However, it was difficult to understand how and why the product came to be this way. I found it necessary to embark on a thorough analysis of the brand and the product in order to better understand the context and design decisions. 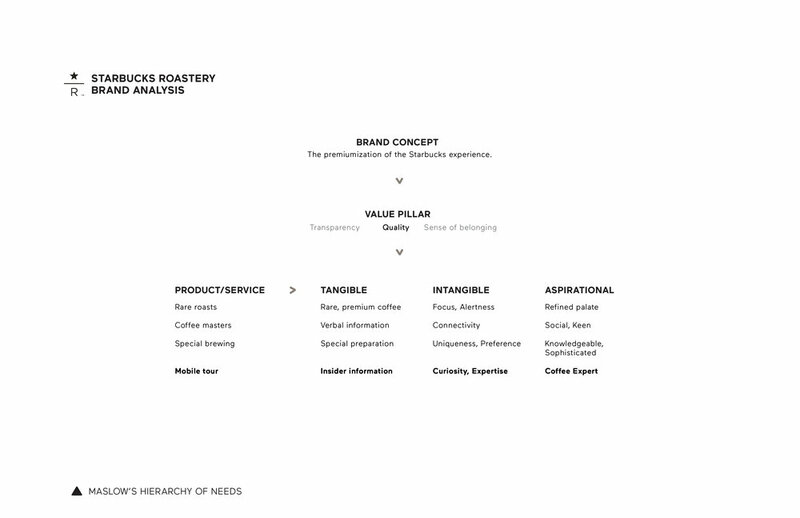 Using Newbery & Farnham’s Brand Value Pillars Framework, I began dissecting the Starbucks Roastery products/ services. Each one of those products/ services offered customers a unique set of tangible, intangible and aspirational value. The collective products/ services were then organized under value pillars of which they reinforced. For example, rare coffee roasts together with professional staff provide different value to the customer, but both help express the higher level value of the ‘quality’ associated with the brand concept. We also identified AKQA’s mobile tour as a product that helped convey the value pillar ‘quality’. This allowed the team to understand how each product/ service played a role within the roastery in order to convey the ultimate concept, which we interpreted as the premiumization of the Starbucks experience. 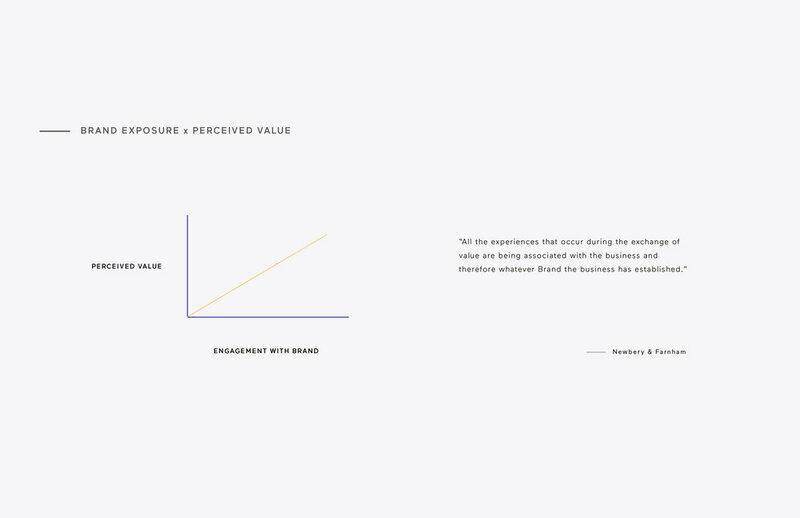 To further explore how the Starbucks Roastery brand was built, I utilized a Brand Attribute Matrix to analyze the mobile tour’s contribution to the brand as a whole. I broke down the product into individual elements and used attributes (secondary) to describe them. The lists of attributes (secondary) were finally described under higher level, primary attributes. This allows the team to check our identification of the product as a means to communicate ‘quality’. We found that the attributes either described or complemented ‘quality’. We also understood that the value pillars can inform brand elements as well as be conveyed by them. We felt that after working through these models and realizing the product’s role within the brand, we were better prepared to analyze the user experience of the mobile tour. I drew the following three important insights regarding user experience from our research to see how AKQA’s web app fulfilled them. Every user experience we design is part of a larger narrative. We realized when designing a product, the customer as well as the business must be considered in order for it to function well. In this case, AKQA designed a complementary part of the in-store experience that provided needs of the consumer as well as the Starbucks Reserve at this location. Our perspective must be inclusive of all stakeholders of the experience. Additionally, AKQA’s web app works within the existing physical space of the Starbucks Reserve Roastery and Tasting Room. Designing an exclusively digital solution would have created a disconnected or incohesive experience between the two. Visitors also enter the in-store experience from a particular context and leave towards another. Allowing these components to influence the design increases our ability as designers to mold a worthwhile and desirable product. 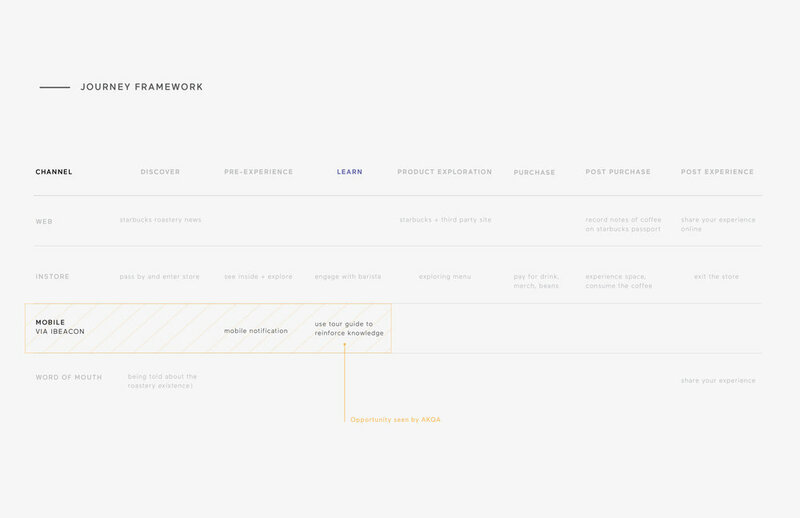 To better understand the product, we created a journey framework to reflect the experience of entering the roastery. We found that AKQA’s web app targeted a very specific portion of the customer journey, but influenced the entirety of the experience. A learning stage was engineered to fulfill a inquisitive customer’s need to understand a coffee bean’s journey. The product not only entices visitors to engage but also enriches the remainder of their experience. Purchasing a cup of coffee isn’t just a drink anymore. Rather, it becomes the product of an intricate story. The more stations in the web app a visitor completes, the more they understand about the quality of the coffee. By increasing brand engagement and exposure, the ability to effectively shift a customer’s expected value from a tangible offering to an aspirational one: becoming a coffee expert. Identifying a ‘focus’ therefore, allows designers to be efficient in the decisions. The previous two principles form an effective dynamic where the a good solution is found at a particular step capable of impacting the entirety of the experience. The purpose of holistic and focused design thinking is ultimately to provide value. Otherwise, who really cares? Similar to a company’s bottom line, the cognitive overhead must be met or exceeded by the promise of benefit through the user experience. AKQA’s web app attempts to both lower cognitive overhead and increase their product value through their mobile tour. Customers not only understands what they’re experiencing in the roastery better but appreciate the quality and exclusivity of the coffee beans being sold there. AKQA offers Starbucks Reserve a way to better convey the tangible value of their coffee. It’s also supporting the intangible and aspirational value of a deeper understanding of coffee and the perceived reputation or prestige associated with that. I interpreted this criteria as the element of surprise and/or its delightful use. The exploratory nature of the web app alongside playful interactions such as the mobile gyroscope and the animations fulfilled this criteria. The product was seamless with the usage of the iBeacon and its notifications. The visual language we all complementary to the physical decor and the existing brand expressions. While the interaction wasn’t completely consistent (some stations you just watch, others involve tasks), using the web app was fairly easy. Furthermore, the content was consistent with the location of the user within the roastery. For example, if the user is learning about how beans are cooled for days through the app, the cask used to store the beans is directly in front of them. Simple instructions were offered before every station. Engaging in the mobile tour required fairly basic technological (mobile) literacy. In conjunction with the visuals, the story was easy to follow along and understand. While there is a debatable discrepancy between the two definitions of innovation (whether ‘new’ the same as ‘innovation’), we felt that AKQA successfully incorporated the use of iBeacons in a unique setting. It allowed for a higher level of precision in location tracking accessible to compatible devices. However, whether the web app provided a significant impact is uncertain. Say if a user enters the roastery without a phone. Is information provided by the physical brochures and signage insufficient or inconvenient for a customer to understand their surroundings? Is Starbucks Reserve losing a sale with the absence of the mobile tour? With this in mind, we concluded the web app has yet to close the Innovation Gap, and therefore lacks measurably distinct impact. Our analysis of the mobile tour and the Starbucks Roastery proved valuable as a means of learning the intricacies of a brand and its products. I believe that as a group we were able to equip one another with an understanding of brand models and user experience principles for us the contribute towards future projects. Despite our evaluation of AKQA’s mobile being potentially unimpactful, it was nonetheless a unique, memorable and personal experience that engaged its customers.